We also offer guided trips out west to Colorado and Wyoming each spring, I spent over a dozen years out there and over 1,500 days on the water so I kind of know my way around. Our annual Western Fling 2014 trip is set for the first week in September, this is a change from our annual spring fling but we are already down to (1) spot left as of 12/03/13, if there are more anglers interested we may increase our anglers and guide staff. Check out our 2014 Western Fling page for more details. SORRY SOLD OUT. TRY AGAIN WITH US ON OUR 2014 TRIPS. Welcome to the 2013 Western Fling web page! Here you can find all of the details you need to know before embarking on this trip of a lifetime, or in many of our clients cases, the trip of the year at least! If you have any questions you of course may feel free to contact me for more information. This is my favorite trip every season and I look forward to another great trip. 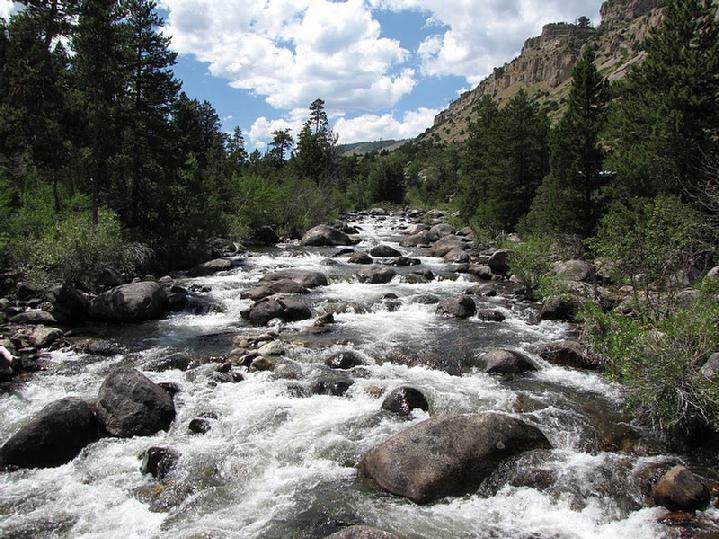 The ranch has four private miles of the Wind River at our disposal as well as over a mile of a private tail water section on another river and a spectacular pond. None of this water is stocked so these fish are WILD not just placed there in a pellet feed station like some ranches offer. Each angler will have the opportunity to fish different sections of water each day as well as float the river in one of our raft drift boats. (see the youtube video) I can’t promise you will land the fish of a life time but what I can tell you is you WILL have the opportunity, what you do with it is up to you and the fish! We can expect to catch Browns, Rainbows, Cutthroat and Mountain Whitefish ranging in size from 12” to 24” with a realistic average of 14”+, It is however not unusual to hook fish over 20” so be ready on every set! There are already at least eight interested anglers, five that say they will give a deposit as the details are released so far I only have one deposit as of 09/18/12 so no chickens counted until the eggs hatch. Just to give you a heads up, last year’s trip filled up by the end of October. Please contact me as soon as possible if you are interested in going. Deposits must be received by December 31st 2012 to lock your spot but I am taking first come first locked in at this point of the planning. A deposit of 50% will be due up front and the final payment or second half due on or before 03/25/13. Deposits are non refundable after 02/25/13 due to the cost of booking, air fare and other rental costs assumed by that time. If you choose to pay via credit card there will be a 3% fee added to cover those feees charged to us. I hope you understand but if everyone paid for their trip by credit card we would be losing aprox. $350 in additional fees. CHECK, CASH OR MONEY ORDER IS FREE. NO FEE! If anyone is traveling with a non-fishing companion please let us know as well as there are many area attractions for horseback riding, casinos and unlimited hiking trails. **** (4) day minimum and $50.00/pp/day discount when booking with another angler. The cost of the trip is $325/angler/day. Which means your total not including air fare for the (5) nights lodging and (5) days of fishing would be $1625 taxes included. We will provide lodging, breakfast, lunch, flies, tipett, leaders, guiding and transportation to and from the river every day you are with us as well as drift boat rafts. If you opt for the bonus day of fishing we will give you a special rate of only $175 for 05/01/13, the trip total would then be $1800/angler (if you book together with a friend, spouse or relative then the trip would be $300.00 less per person because of the $50.00/angler/day discount.) We can provide transportation from Ft. Collins, CO to Dubois and back as long as you arrive and leave on the days we are going back and forth at no additional cost, see trip calendar. Gratuities are not included in the package price but are GREATLY appreciated. The trip will be limited to between four and six anglers depending on bookings and to ensure the best possible experience. Breakfast at the Flying W around 8:00am, coffee on about 6:30am. Tom and I will cook for you and prepare the lunches for the day as well. The usual breakfast fare will be available if you have a specific request like rye bread or sausage patties instead of links or apple juice, you get the idea…let us know before we get out there and we can be sure to get it on our shopping list. We will be leaving the Flying W around 9:00am each day to hit the water so whether you choose to join us for breakfast is up to you but you MUST be ready to go by 9:00am. Be respectful of all other anglers and please be on time. :O) We will fish until around 1pm and at that time get some lunch on the riverside and continue fishing for several hours after lunch. If you have not had enough fishing for the day you can continue fishing on your own right out our back door when we return to the Flying W which is located on some fantastic water on the Wind River. Some anglers will want to fish until dark and some will want to stop much sooner so this is the best way to give everyone the amount of fishing time that suits them best and if they want to relax where we are staying for the evening they have that option. If you have any dietary restrictions, notify us ahead of time to accommodate those concerns. Dinner expense is up to the angler, since everyone has different tastes and budgets for dinner. In years past we will usually eat out a couple of the nights to visit the local establishments and BBQ and cook the rest of the nights together at the Flying W. It is nice to be able to get in a good day of fishing nad sit and relax with everyone together on the back deck. You are more than welcome to join us or eat on your own, whatever works best for you if you want to go somewhere different please feel free to do so as several options will be within walking distance. Plan on catching lots of nice fish and come with a great attitude and this trip will be a great success. Our goal is to fish each day and use multiple techniques in a fantastic setting and teaching environment so please ask questions and be ready to absorb. 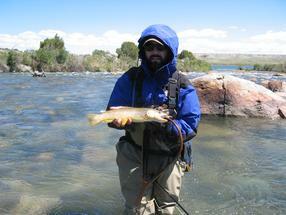 Most wading will be in moving water, the flows at this time of the season are generally low as it is pre-runoff. There may be some areas that require more aggressive wading and so a staff would be useful if you generally carry one. If there is ever a point you are uncomfortable with the wading please let us know and we will make sure we get you into a run that is more suited to your comfort level. You will want to carry at least two rods with you on the trip, especially if one breaks! Hopefully not and we will have extras should the emergency arise. Most fishing can be comfortably done with a 6wt. rod on the ranch and a 4wt. rod on smaller streams. I would suggest if you have a 4 and 6 wt. rod to bring them if you don’t have these particular rods you should at least have one that is a 6 or 7wt. to throw into the wind with heavier flies. A 5wt. WILL be light for many of the situations so please talk to us ahead of time in case you need us to bring a heavier rod for you. Nothing is worse than being in an area with big fish and wind and not being able to deliver the fly! Remember we will be providing leaders, tippet, all accesories and flies so if you don’t want to bring your vest, please don’t! Floating lines are all you will need, no sinking necessary. Please make sure your waders are not leaking ahead of time as we will not be carrying extras, other than a repair kit. Boots should definitely be studded; however to get into the drift boats you must have straight felt or rubber or at least be able to remove your spikes. NO SPIKES IN THE BOAT! We do sell Korkers in the shop and their soles are removable and interchangeable if you are looking for a new pair. If anyone would like us to provide the boots and waders for them we can do that at an expense of $100 to cover shipping expenses for the extra gear and you should let us know this a.s.a.p., not later than one month prior to ensure we have all the correct sizes in gear. This $100 could be applied toward the purchase of the boots and waders when the trip is over. I have listed several taxi and rental services out of the Riverton Regional Airport in Lander, WY, if you choice to fly into a different airport or drive out west please let me know so we can make sure you get where you are going. We can pick you up and drop you off here at this airport if you choose to fly directly into Riverton, WY. We can provide transportation from Ft. Collins, CO to Dubois and back as long as you arrive and leave on the days we are going back and forth at no additional cost, see trip calendar. 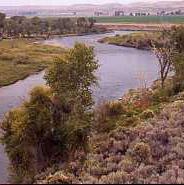 If you plan on exploring the casino's around Ft. Washakie, about 15 minutes from where we are staying, and area on your own during the off time in the evening than you will want to rent a vehicle as we will only be providing transportation to the fishing and to down town at dinner time. It is less expensive to fly into Salt Lake or Denver but you wil have to factor in gas and driving times as well as rental car if you are not arriving and leaving on the same days as in the trip calendar.